Winter Park, the name says it all – it’s a playground for winter sports lovers and Colorado’s oldest resort, since 1939. Winter Park resort is convenient from Denver – just over scenic Berthoud Pass, a 1.5 hour drive from Denver International Airport. With two dozen lifts and 3,081 acres of skiing, Winter Park is one of the largest areas in Colorado – spanning seven territories, like unique ski areas within one big resort. Winter Park has two separate base areas, Mary Jane and Winter Park, but all the terrain is interconnected via the 25 lifts. Winter Park Village is extensive with slope-side lodging, a Mountain Adventure Center, Children’s Programs, ski shops and slope view dining at Doc’s. All winter long, Winter Park has fun family events from après ski bonfires to snow cat dining at the Summit, with the best torchlight parade ever on Christmas Eve. Mogul skiers will find their haven at Winter Park, as Mary Jane is bumps galore on a dozen runs. Mary Jane sounds tame, but it is named for the gal who “serviced” the men rather liberally during the railroad construction here (she made so much money turning tricks she bought a huge land claim here), it is not named to reflect Colorado’s liberal marijuana laws and dispensaries, despite rumors. 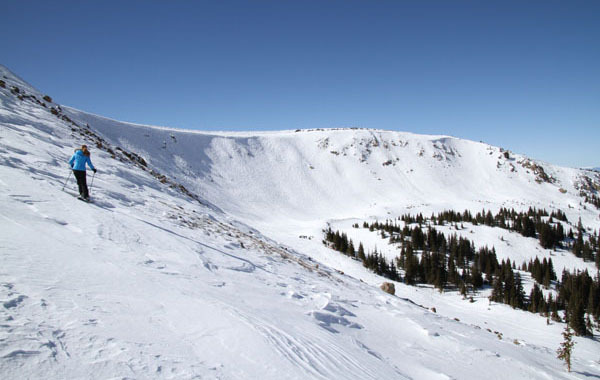 My favorite skiing at Winter Park is on Panoramic – riding the highest six pack lift in North America at Winter Park’s 12,060’ where you will find all above tree line snowfields in Parsenn Bowl that drops into snowy glades toward Mary Jane. The Headwall in the Cirque is double black diamond – after a short hike an traverse a snow cat picks you up to access this wilder high elevation ungroomed terrain. Otherwise, there is nothing super steep at Winter Park, in fact there are plateaus and very gently pitched terrain throughout the resort, especially Vasquez Ridge, Olympia and Pioneer. Eagle Wind has some pitch and earthy glades served by a triple. The Front Side, the original Winter Park since 1939, has good pitch on typically well-groomed fun trails descending toward the village which is served by another six passenger high speed lift. For lunch, go to the beautiful Sunspot Lodge at 10,713′, the table service restaurant has delicious buffalo chili, and spectacular views of the Rockies in all directions, with a big fireplace centerpiece. Winter Park’s children’s program and the disabled skier program are some of the biggest and best in the country. Families will find lodging deals at Winter Park. The Village at Winter Park was built by Intrawest featuring a heated pedestrian plaza, restaurants like Doc’s and Derailers, ski shops and services plus super convenient ski in ski out lodging at The Zephyr Mountain Lodge, Fraser Crossing and Founders Pointe. Winter Park is quieter and more family-oriented than après ski havens of Vail or Aspen. The skiers and riders at Winter Park are more humble, less fancy than Aspen and Vail by comparison. Staying in downtown Winter Park is great value, just 3 miles to the resort via car or free shuttle. The Trailhead Inn has been completely remodeled (formerly the Olympia) with modest comfortable rooms, an indoor pool and hot tub and great rates. From here you can walk to shops and restaurants on the sidewalks, over a covered bride, to Volario’s – a wonderful Italian bistro, and Vasquez Caffe for breakfast lattes, delicious frittatas and baked goods on your way to the slopes. Winter Park also has staples like McDonalds and Subway – with better curb appeal than usual, and plenty of ski shops and necessities. Locals rave about funky western style eateries like The Ranch House at Devil’s Thumb for rustic steaks and sleigh rides, or Gasthaus Eichler for Austrian fare in an alpine setting. Winter Park is popular with Denver skiers, since its easy to reach on the Front Range, in Summit County, for day trip skiing. 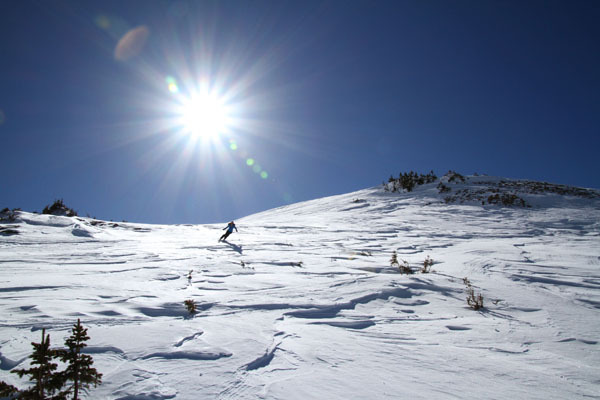 Winter Park is also one of our Top Colorado Ski Resorts for a Family Ski Trip.